Repair of recurrent hernias has always been a challenge for surgeons. The search for the optimum method for repairing inguinal hernias has been ongoing since Bassini introduced the anterior repair over 100 years ago . Bassini’s repair gained universal acceptance and widespread application in a very short period. Many variations, however, have been introduced in an attempt to reduce morbidity, recurrence rates, and duration of hospitalization. 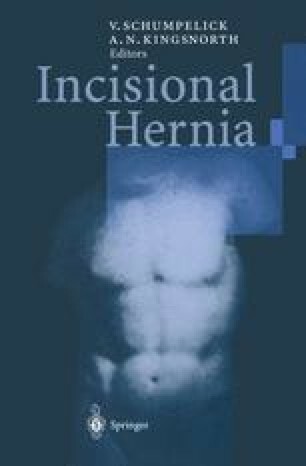 Since his original description, more than 80 approaches for anterior repair of inguinal hernia and femoral hernias have been reported . Bassini’s repair and its many modifications share the reinforcement of the floor of the groin by overlapping or approximating adjacent viable tissue. The success of the technique is based on the strength of the suture material and the resulting scar. It is noteworthy that Bassini’s incidence of recurrence was only 3% . Today, the incidence of recurrence with this approach by other surgeons is between 1.9% and 32% [4,5].